FinTech today is reimagining almost every aspect of financial operation, whether it be wealth management, banking or payments. The legacy era of waiting in line at the bank with deposit slips has come to an end as the rise in online banking technology and customers using a wide variety of financial wellness platforms have changed the face of financial operations completely. As the space has evolved and has embraced innovations, new platforms have continued to emerge injecting the latest technologies and trends in the FinTech marketplace. One such trend has been the rapid proliferation and acceptance of applications based on blockchain technology. The technology which was originally developed as a way of securing cryptocurrency transactions, has become the next big thing for the financial services companies as they look out for options to implement blockchain within their institutions. Another key technological trend has been revolving around the use of machine learning and behavioral science which has opened the doorways towards new opportunities to literally rewrite tomorrow and can drive the industry forward in entirely new ways. The future of fintech is indeed here, and this has inturn given rise to opportunities to evolve with the technology. 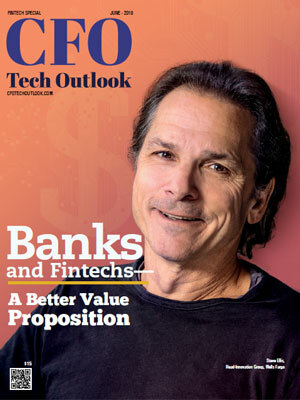 To help navigate CFOs through the list of innovative vendors and their technology, our distinguished selection panel, comprising CEOs, CFOs, VCs, industry analysts and the editorial board of CFO Tech Outlook has selected the Top 10 Fintech Solution Providers 2018 that exhibit competence in delivering advanced technology to fabricate a connected and immune fintech mechanism. We present to you CFO Tech Outlook’s Top 10 Fintech Solution Providers - 2018.